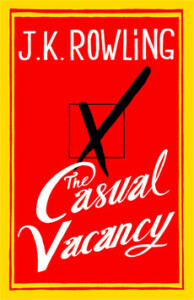 The Casual Vacancy is a masterclass in how to plot a novel. There are lots of interesting and connected characters, most of whom live in a picture-postcard English village called Pagford, and lots of interesting and connected things happen to them. The characters are linked through the Pagford Parish Council, the local secondary school or the medical centre. Like a camera on a magical flying dolly, Rowling focuses in on one individual, pulls out to look at their family and friends and then zooms up out of the house or school or hall, off to find someone else to catch up on their story, their family and friends. It’s old school, like Charles Dickens or George Eliot, a brick of a novel teeming with life, a real universe to lose yourself in.